EvoWars.io is a fun multiplayer io game set in an epic fantasy world. You must control a deadly and courageous warrior and attempt to slay your enemies with your immense broadsword. For each enemy, you damage or kill, the length of your sword increases. Which in turn allows you to dish out more death and destruction. Move quickly around the map and try to evade swings from other player’s swords whilst killing as many opponents as you can. So you must move with purpose and time your sword swings carefully! Can you dominate the EvoWars and become a giant slayer with the biggest sword in the land? 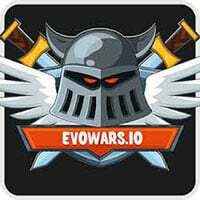 So enjoy and have fun in playing EvoWars.io Game. Also make sure to check out Snowball.io Game, you may enjoy playing it. Intense slashing gameplay to eliminate opponents. You can level up to increase the size and evolve to more than 15 character models. Define your own play style and use every opportunity as good as possible. Sprint ability at the cost of your experience points.